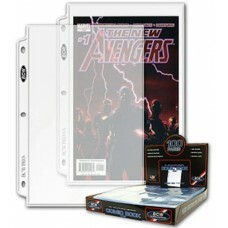 BCW Comic Book Album Pages hold Current or Silver Age Comic Books and fit in any Standard 3-Ring Binder. These pages are made of Acid-Free, Archival Safe Heavy Polypropylene which is safe for long term storage of your comic books. Each page holds 1 Comic Book.